The DataCal Turkish Q Labels+ Keyboard is an English (US) keyboard with Turkish Q language labels already installed for you. This creates a high-quality, durable, bilingual keyboard that is ready to use out of the box. The Turkish Q Labels+ Keyboard conforms to the Turkish Q keyboard layout in Windows XP. 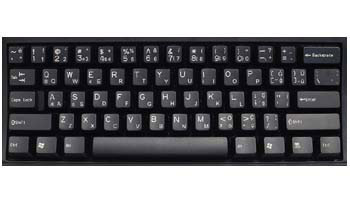 The Turkish Q keyboard layout is used primarily by non-Turkish computer users because it is more similar to the English QWERTY keyboard layout. This language is supported in Windows Vista, XP, ME, 98, and 95. Turkish Q labels are a very economical option for creating a bilingual Turkish Q keyboard. The letters are printed on the underside of the labels so that the lettering will not wear off. This affords you with many years of durable use. We also have the Turkish F layout labels. The Turkish F keyboard layout is based on the standard Turkish keyboard and is used mostly by people who learned Turkish typing on a Turkish F keyboard. The Turkish F keyboard layout is used almost exclusively in Turkey. The Turkish Q keyboard layout uses a system of deadkeys (highlighted in yellow below) to type certain accented characters. To use the deadkey system, first type the deadkey; nothing will appear on the screen. Next, type the key (generally a vowel) that you wish to combine with the deadkey. You should then see the accented character that you want on the screen. If you press a deadkey and then a press a key that does not go with that accent (such as pressing an accent and the number "2"), nothing happens; the accent deadkey must be correct to work. Depending upon the language, deadkeys work with both unshifted and shifted keys.